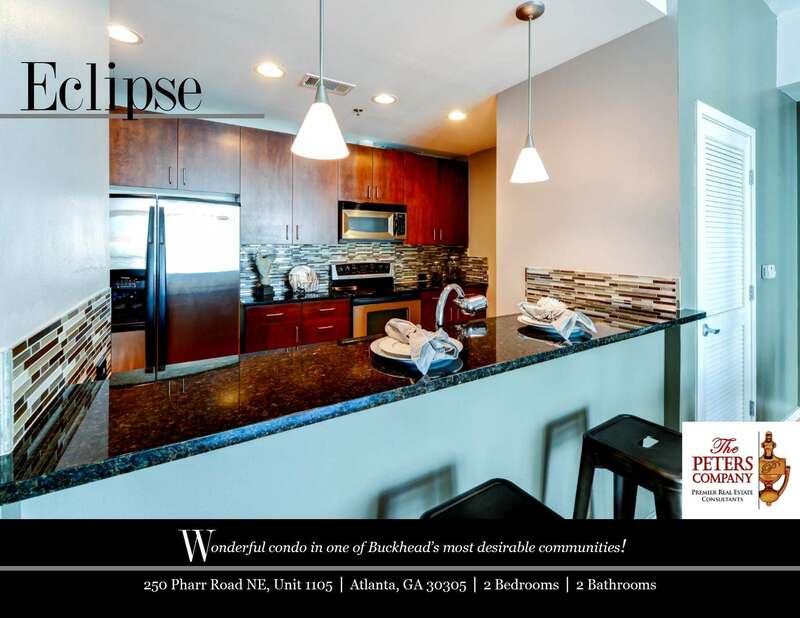 Just Listed :: Amazing Views in Buckhead's Eclipse! Welcome home to this wonderful two-bedroom, two bathroom condominium on the 11th floor in Buckhead’s private and highly sought-after Eclipse building. Convenient to Buckhead’s finest attractions, you will be in the middle of it all including prestigious shopping, award-winning restaurants, and exciting nightlife. Easy access to I-85, I-75, GA400, and Peachtree Road make virtually all commutes a breeze. Kitchen features stainless steel appliances, sleek backsplash, granite counters, and breakfast bar. The main living area is accented by gleaming hardwood floors, and includes a nice combination of living room and dining area which are perfect for entertaining. Master suite is complete with a walk-in closet and bathroom with garden tub and granite vanity. Secondary bedroom with walk-in closet and attached bathroom is well-sized and bright. Laundry conveniently located in the unit with washer and dryer included in the sale of the property. Balcony provides additional living and lounging space with great views of all the excitement in the new Buckhead Atlanta development. Wonderful sunset views as well. Additional amenities include secure access between floors, a well-maintained pool, fitness center, and clubhouse with catering kitchen, pool table, and media room. ← Why Do I Need a Survey?